Fifty ATF agents raid a remote compound outside Waco, Texas, at dawn to execute search and arrest warrants. The search warrant identifies two .50-caliber Browning Machine Guns; the arrest warrant names Jesus Christ. The ATF agents don't make it to the front doors. Ninety miles south in Austin, Professor John Bookman reads a letter from an old woman whose daughter took her two young girls to live in a religious cult six years before. Her daughter wrote that the End of Days is near. She fears they might drink the Kool-Aid. She begs Book to save her granddaughters. The cult inhabits a massive compound called the Garden of Eden outside Waco. Book and his intern travel to the compound intent on bringing the girls out peaceably, only to find the Feds there first—and to learn that peace is not an option. Buckle up, boys and girls, it’s going to be a bumpy ride. I think you will enjoy it. I guarantee you will not expect it. 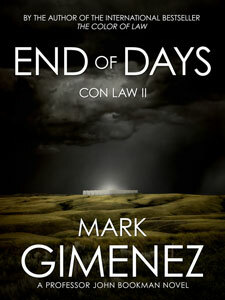 END OF DAYS (Con Law II), the second book in the Professor John Bookman series, is now on sale in e-book on Amazon, Nook, Kobo, and iBooks throughout the world. The links below will take you directly to the sites. This book will not be published in print editions. The new economics of the book business have changed the publishing landscape forever. The upside is that the e-book can be sold at a much lower price than print because the costs of production and distribution are avoided. I hope you enjoy reading the book as much as I enjoyed writing it. I look forward to hearing from each of you. Happy Holidays and best wishes for 2018.